These amazing coloured markers are the perfect tools for budding artists honing their craft. They are dual-tipped, with one end containing the standard marker tip, and the other end providing a brush tip to produce a more 'flowy' effect. The markers come in a neat plastic carry case, complete with a little handle. 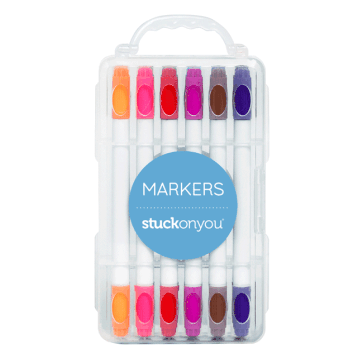 The desire to have a full set of markers, as well as the satisfying 'click' when each marker is slotted into its place, will surely motivate your little artist to not leave the markers lying around!